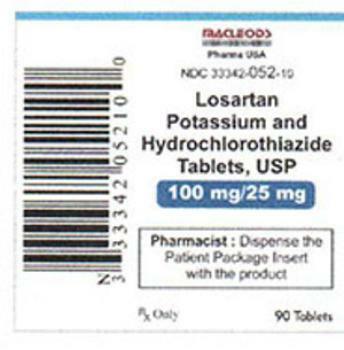 Macleods Pharmaceuticals Limited is recalling one lot of Losartan Potassium/Hydrochlorothiazide combination tablets, a high blood pressure treatment. Trace amounts of an unexpected impurity -- N-nitrosodiethylamine (NDEA) -- were detected found in the product. NDEA, which occurs naturally in certain foods, drinking water, air pollution, and industrial processes, has been classified as a probable human carcinogen by the International Agency for Research on Cancer. There are no reports of adverse events related to this recall. The recalled product was sold nationwide to Macleods wholesale distributor and retail customers. Macleods Pharmaceuticals is notifying its customers by phone and/or in writing. Instructions for returning recalled products are given in the recall letter. Consumers with questions regarding the return of the recalled product may contact Qualanex at (888) 280-2042 from 7:00 am to 4:00 pm (CST) Monday – Friday or by email at recall@qualanex.com.